The dog days of summer are here. Which can be hard on your AC unit and your pets. Keeping your pup cool during the hottest months doesn’t have to be a hassle though. With some careful planning, an HVAC tune-up and a few fun pet products, you and Fido can beat the heat without breaking the bank. Turn off the ceiling fan. Fans cool humans by evaporating the sweat on our skin. 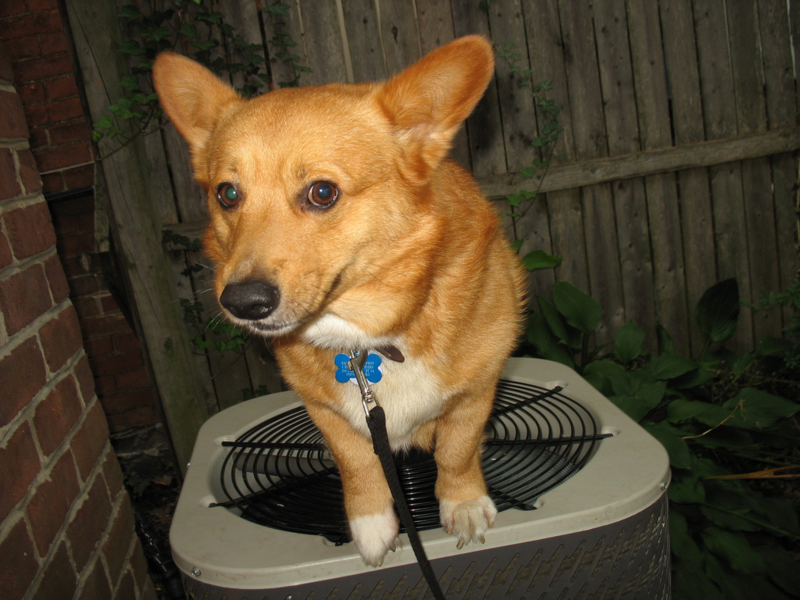 But because dogs don’t sweat, the air flow from a fan isn’t going to make much of a difference for them in the summer. So, leave the fan off to save money and energy. Turn off the lights. Natural light isn’t just for Instagram filters. Pets love it too. The SPCA of Texas says if dogs are home without you, natural light is best light for them. Plus, turning the lights off causes less heat output, which helps keeps your AC from working overtime. Turn off the TV. Leaving your TV on all day can drive up energy costs by raising indoor temperatures and making your pet more active during the day when they should be resting. DOG TREAT — Feeling bad about turning the TV off? Keep your doggo distracted with the Aveva Rubber Frozen Bone toy, or give them some peanut butter flavored ice cream. Setting your thermostat to 78 degrees helps cut back on energy costs in the summer. Since regular body temperature for dogs is 3-4 degrees higher than humans, turning the thermostat up won’t adversely affect them. A programmable or smart thermostat will keep your temps on track. The Trane ComfortLink™ II XL1050 thermostat allows you to program and adjust temperatures from the house or on-the-go. DOG TREAT — Still worried about air flow? Try a raised bed for your dog. Elevated beds help keep your dog cool by providing more ventilation and circulating air underneath them. The Kuranda Dog Bed can take your dog to the next level. Literally. Your AC could be running on overdrive without you even knowing, especially if cool air is escaping from doors, windows or air ducts. Adding weather stripping to doors and windows that have gaps in them can keep hot air out. Check to see where plumbing and electrical wiring is coming into your home to make sure there are no big openings. DOG TREAT — Speaking of keeping cool air in, dog cooling mats are so hot right now. These mats are packed with gel technology that absorbs your dog’s temperature and cools them down. PetTherapeutics makes a number of different cooling beds for your pup. Keep the blinds closed during the hottest parts of the day or while you’re at work. This helps keep unwanted heat from coming in via the greenhouse effect your windows can produce. For those of us who didn’t pay attention in 8th grade science this means sunlight and heat enter, but can’t escape. Which makes your house hotter. Close the drapes, or if you have blinds, tilt the slats upward to help reflect light away from your house. DOG TREAT — Keep your dog’s water cooler than being cool with the K&H Coolin’ Bowl. All you have to do is freeze it’s inner gel core overnight and then add water to the bowl to activate the gel crystals. It will keep your pet’s water cold for up to 15 hours. Check your air filters once a month, especially in the summer, to make sure they are clear from dust and debris. A clogged filter can cause your AC to work overtime. Switching out your filters is a smart way to conserve your energy bill and keep your HVAC working smoothly. On top of monthly air filter checks, having your HVAC cleaned and inspected by a Trane Comfort Specialist helps keep things running smoothly all summer long.